Oxford University is going to conduct high-risk eye surgeries using robots. Researchers from Oxford University have partnered with the Dutch robotics company Preceyes to test out a new robotic surgical instrument that seems especially promising. Eye surgeon and researcher Robert MacLaren, Professor of Ophthalmology at the University of Oxford, will lead the team, which will be conducting human trials with the PRECEYES Surgical System. Oxford and Preceyes have also inked a deal with Nightstar to begin engineering high-precision drug delivery technology for the eye. Nightstar is a biopharmaceutical company that specializes in developing directed therapies for retinal diseases and dystrophies, such as choroideremia. So far, this new technology has been tailored to ocular surgery, with vitreoretinal procedures as the initial target market. The aim is to improve the quality of ocular surgery, and to develop novel treatments such as precise drug delivery to the target tissues. Eye operations are highly sensitive and risky, so the significance of this technology is that it will assist surgeons to perform even the most demanding surgical tasks with the utmost precision and care. And ocular surgery is just the beginning. The extreme delicacy of operating on the eye makes it a perfect testing ground for these robotic medical devices. If they can pull that off, what can’t they do? 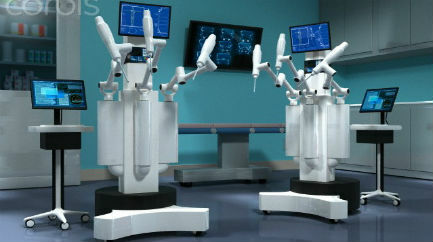 But the future will see broader applications of robotic, or robot-mediated, surgery. Delicate neurological operations, spinal surgeries, heart procedures, all of these are certain to eventually be performed by robotic devices that possess a greater manual precision and steadiness than even the most practiced and assured surgeon. In the meantime—baby steps. The eyes may be the windows to the soul, but in the case of robotic surgery, they are also windows to the newest evolution of surgical technology.